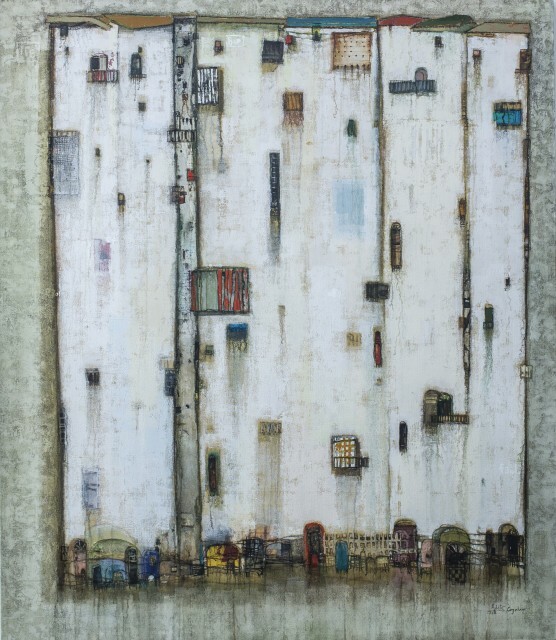 Addis Gezehagn (b.1978), a long-time artistic presence in Addis Ababa, is known for portraying the multifaceted characteristics of the city’s residents by detailing the external facades of their homes. In his “Floating Cities/ Floating Towers” series, Addis Gezehagn depicts dreamlike deconstructed and layered renderings of the urban landscapes rising above the ground. These compositions made by layering magazine cut outs with acrylic paint, blend the boundaries of fantasy and reality of urban life, blurring the lines between the past, present and future. Flattened and reductive, Gezehagn’s works imagine cityscapes as towers, or patchworks of colourful doors and gates, the architectural structures seeming to signify a natural, organic network of living spaces. The rootless and ephemeral nature of the layered towers, call into question the lives of the inhabitants. Examining the personal and public spaces, the works archive walls and towers destined to crumble, tracing a pattern of classism and social injustice. Gezehagn’s works urge us to think beyond homes as functional entities and offer commentary on the socio-economic context of urban life. Gezehagn currently lives and works in Addis Ababa, Ethiopia. He graduated from the Alle School of Fine Arts and Design with a Diploma and BFA in 2011. His first international showing was in 2017 at 1:54 Contemporary African Art Fair in London which was received with great acclaim. Since then, he has gone from strength to strength, garnering more international interest after having his first sold out solo show at Addis Fine Art’s main gallery in Addis Ababa in 2018.